Welcome to the College of Education and Human Development at Texas A&M University-San Antonio. 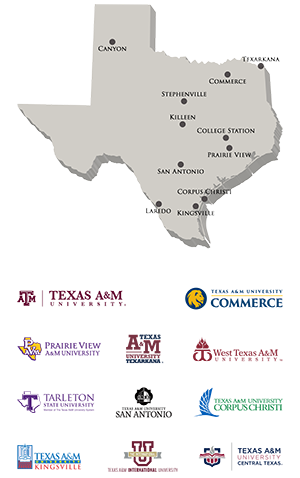 Texas A&M University-San Antonio's College of Education & Human Development is committed to educational opportunities toward the completion of baccalaureate and graduate degree programs in San Antonio. Located on the south side of the city, the College of Education and Human Development is committed to serving the needs of the region by preparing qualified professionals to assume positions of responsibility and leadership in a global society. Students in our College have a passion for serving the local community. Whether as aspiring teachers, future physical therapists, school leaders, or mental health professionals, our common link is our desire to serve. What makes our College of Education and Human Development unique is our emphasis on building partnerships within the local community. These partnerships provide opportunities for our students to gain hands-on experience with potential future employers as they complete internships, practica, student teaching, and a variety of field experiences. We invite you to join us as we blend theory with practice so that our graduates are “Ready from Day One” to make a difference in our local community. Hear from Program Graduates in their own words: The videos below provide insight from students who have recently completed various degrees within the College of Education and Human Development. We have great news! The College of Education and Human Development first-semester scholarship for graduate studies is now being offered for a limited time to students enrolling during the Fall 2019 semester. Qualified applicants who are selected by the committee will receive a $1000 scholarship towards their first semester tuition. Our academic advisors assist students with the admissions process, counseling on the most appropriate major for the student's personal interests and career goals, and the transfer process. Take a closer look at the College of Education & Human Development at Texas A&M University-San Antonio. Watch our video about Texas A&M University-San Antonio's Ready From Day One program.